the representative of Yokohama’s Chinese town. They appear very familiar to us, packed in red boxes which can be bought at kiosks in stations including Yokohama, Tokyo and Shinjuku. When you open “KIYOKEN’s” shao mai lunch box, you will find on its side a gourd-shaped soy sauce container named as “hyouchan”. 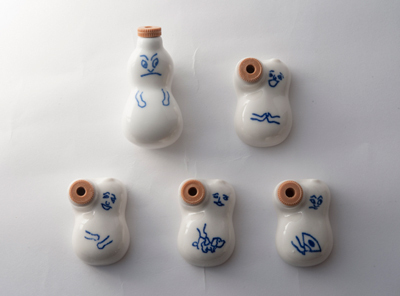 This white porcelain container is illustrated by diverse facial expressions which were originally drawn by a very popular cartoonist then, named Ryuichi Yokoyama in 1955. In 1988, a famous illustrator named Osamu Harada created new versions of illustrations for the containers. And later on, many other facial versions of “hyouchan” appeared on special occasions such Christmas or in celebration of the 100th anniversary of “KIYOKEN”. In the photo, you will see series of original versions of “hyouchan” which came back on scene since Heisei 15 (2003). We can find many collectors and they have even become items on trade in auctions online. When you have the chance to visit Tokyo, you should definitely try “KIYOKEN’s” shao mai lunch box! In modern Japan, we often play on words. For instance, June 4th read in Japanese can be played on words as such; “June” can be read as “mu” in Japanese and “four” can also be read as “shi”, which will together read “mushi”. And when adding “ba” after “mushi”, it reads “mushiba” meaning cavity. Hence, June 4th in Japan is the day for preventing cavities. “Nakamura goushi” is also a type of traditional pattern including such play on words with the letter “six” or “mu” in Japanese. The number “six” is included in the Japanese name “Nakamura”, between “Naka” and “ra”, which is “mu”. 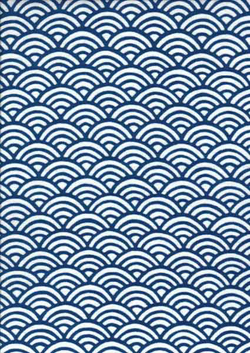 During the Edo period, the public were forbidden to enjoy luxurious things and thus, very simple stripe and grid patterns were widely circulated and consumed. 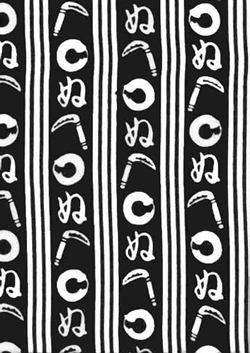 Kabuki actors who were also fashion leaders of that period would also use these simple patterns but added their names and house names for originality. 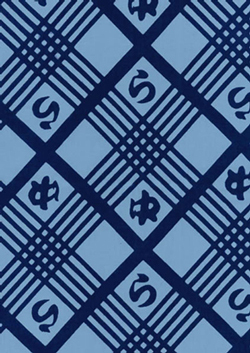 This traditional pattern was used for the house of Nakamura family. This particular pattern of “Nakamura goushi” illustrates the house name of “Nakamura” using this simple grid style design. 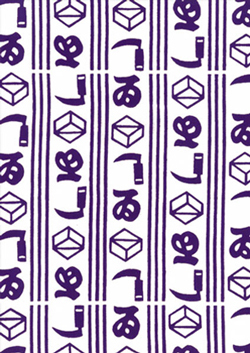 It includes five thin lines and one thick line, which totals six numbers of lines which would read “mu” in Japanese meaning “six” in English. Furthermore, it also includes two other parts of the name “Naka” written as “中” using the Chinese letter and “ra” written as “ら” using the Japanese letter. Combining the three parts together would present the house name “Naka mu ra”, together with “koushi” signifying the grid style pattern. Masks with humorous expressions. Their colors and shapes are very beautiful, aren’t they? These masks are traditional folk crafts which have kept is tradition from the Edo period and made from Japanese paper or washi. 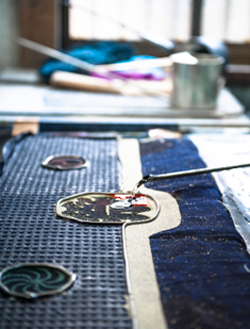 Its making process involves pasting multi-layers of washi and once they are dry, we unmold it. 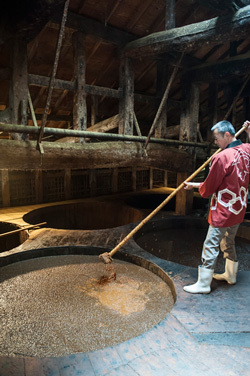 This particular technique is called “hariko” and there are numerous folk crafts made using this technique nationwide. The soft and gentle touches of washi, together with the bright colors make them very attractive. 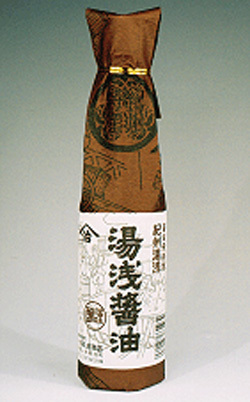 Washi is made of paper, but you will be astonished by its toughness and durability. The mask of a man wearing the polka-dotted tenugui (Japanese washcloth) has a name of “hyottoko”. Moreover, the mask of a woman with puffy pink cheeks is named “okame”. The bright red colored mask is the “red ogre”. 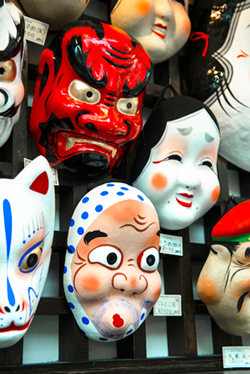 When you visit Japanese festivals, you will find shops selling these traditional masks but as well as masks made of plastic with popular animation characters.